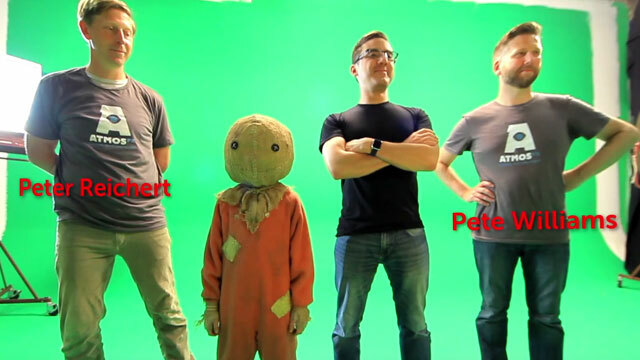 FrightFind recently interviewed Michael Dougherty, director of cult fav Trick ‘r Treat, along with Pete Reichert and Pete Williams, founders of AtmosFX Digital Decorations. After working together as animators and producers at MTV in 1990s, these three old friends got back together this year to seal a licensing deal to use the iconic character of Sam from Trick ‘r Treat as the latest product offering from AtmosFX for people to use in home Halloween displays and professional haunts. “It’s a dream come true for the three of us,” Dougherty said of the collaboration. Dougherty is a writer, director, producer, and artist who directed the hit horror-comedy Krampus as well as cult Halloween favorite Trick ‘r Treat. Reichert and Williams, who have deep experience in the animation and entertainment industries, co-founded AtmosFX in 2005. There are currently 17 AtmosFX Digital Decorations on the market, as well as additional peripheral products. 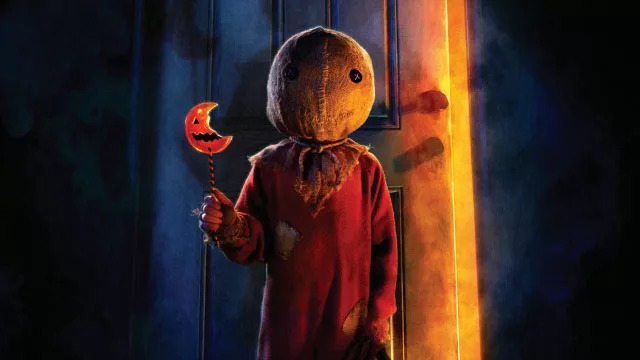 FrightFind talked with the three about how the licensing deal came about, the growing popularity of the character Sam, and also shared some news about the Trick ‘r Treat sequel now in the works. 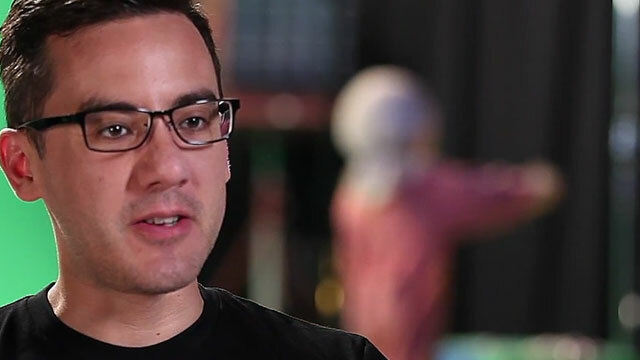 Read more about AtmosFX partnership with Michael Dougherty and Legendary Entertainment. FrightFind: How did this project get started? Michael Dougherty: I love decorating for Halloween, and especially enjoy adding new stuff to my arsenal each year terrify trick or treaters. So the next step was to add holographic stuff. I’ve loved Disney’s Haunted Mansion for decades, and realized that combining a consumer level projector with a QuickTime movie of ghosts you could have Haunted Mansion-style ghosts in your windows and doorways. I’m always upping the ante to decorate my own house and wanted holographic ghosts like those in Disney’s haunted mansion. After making my own for a while, I discovered AtmosFX professional quality digital decorations, immediately bought one and was overjoyed. So I looked online and discovered a company was making these. Then after I bought some of the products I realized the company was founded by two old friends of mine from my MTV animation days, Pete Reichert and Pete Williams. So I emailed them and told them I loved what they were doing. We then brainstormed a plan to do Trick ‘r Treat branded digital Halloween decorations. Working on this collaboration is a dream come true for the three of us. FF: And naturally Sam was a perfect fit. FF: And you’ll be doing this at your house this year, Mike? Pete Reichert: After Mike reached out to us, we got together to discuss collaboration. And the natural idea was to use Sam in digital decoration. Most of our decorations are driven by characters, and this is first opportunity to license a character that is perfect to showcase as a digital decoration to project onto walls and windows. Pete Williams: Pete and I are huge fans of Trick ‘r Treat, so it’s an honor to collaborate. The idea of using such an iconic character – essentially the mascot for Halloween – in one of digital decorations was an astounding opportunity and we’re thrilled it’s worked out. PR: Halloween decorations needs some modernizing, and this is a tasteful, fun, and innovative way to increase the quality of your average yard haunt. FF: Now with Sam being the flagship character is there talk of AtmosFX using other Michael Dougherty characters in digital decorations? Perhaps something for AtmosCheer? Maybe we’ll see a release of Krampus products at some point? PW: We’ve talked about it. But we wanted to get Sam done right first, so maybe that’s next. Pete and I are huge fans of Krampus and would like to explore bringing the character to life in a digital decoration for the Christmas holidays. 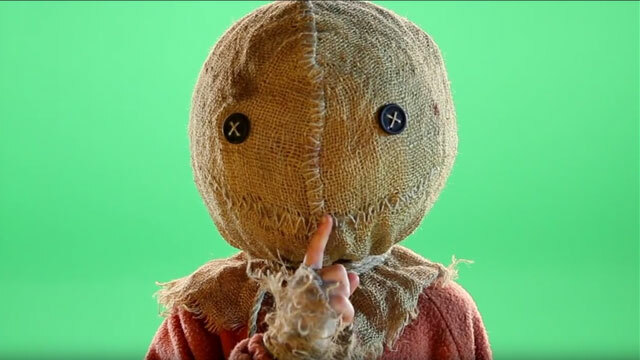 FF: I heard a sequel to Trick ‘r Treat is in the works? Are you working on something together? MD: We are looking to further the relationship between Legendary Entertainment and AtmosFX, but this has nothing to do with actual sequel at this time. FF: Let’s talk about Trick ‘r Treat. It launched in 2007, and came out later on DVD, and is a real cult favorite among horror fans. Its popularity seems to be picking up with Sam costumes and decorations available, and now the sequel coming along, do you see Sam evolving into a major horror character like Mike Meyers, Jason, Jigsaw, or others? MD: Maybe. Only time will tell. But he’s definitely getting out there and making a name for himself. FF: Can we expect more licensed products in the future from the AtmosFX and Legendary relationship? PW: Nothing is set at the moment. Right now our focus is on making the Trick ‘r Treat decorations as good as possible. FF: The audience for AtmosFX is certainly growing. 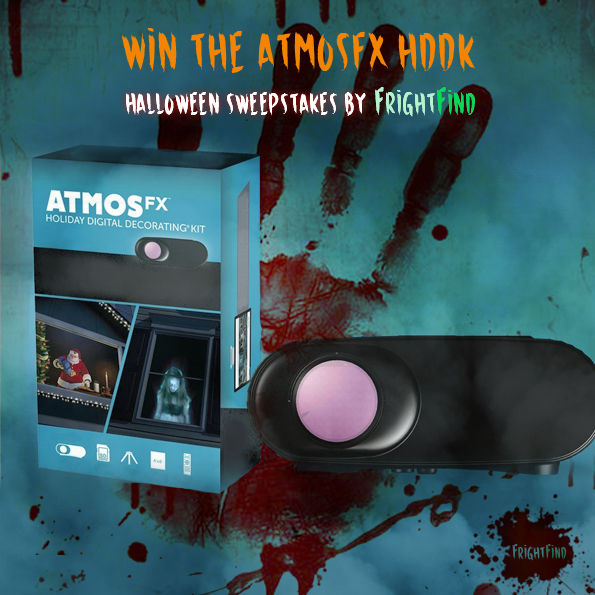 When we were at West Coast Haunters Convention in Portland this year we saw a lot of interest from people creating elaborate home haunts and decorations, and found many people had heard of AtmosFx. PR: We love the home haunter community and the haunted attraction community, and our hope with Trick ‘r Treat is to reach a broader market of fans of home decoration. We want everyone who loves Halloween to put on bigger displays to entertain neighbors, their kids, and trick or treaters. We see Sam as a perfect character to help us get more people involved. MD: I’m also a home haunter and look forward to Halloween every year. The past 4 or 5 years I’ve used the AtmosFx products and have seen my audience at home grow every year. Everyone loves it. It really kicks things up a notch and adds something magical. 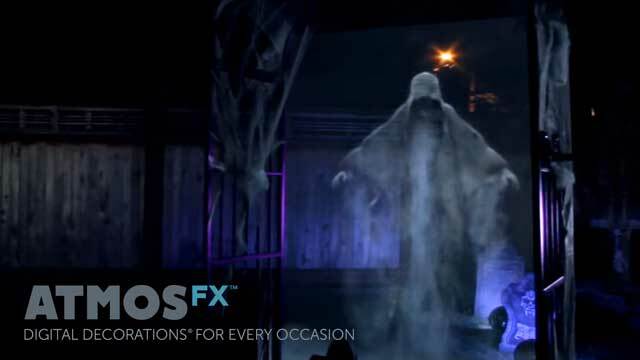 FF: We use AtmosFX ins our Halloween yard displays too and love watching the crowds gather in our yards just to watch the show. MD: Exactly! They want to see what happens next. FF: Final question. What candy do you hand out at Halloween? Check out the full range of Halloween and other holiday digital decorations at AtmosFX.